While South Africa is in the middle of winter, there is something to look forward to—the upcoming spring! Once spring hits, we can start to enjoy the outdoors in our garden where we can relax, sunbathe and spend time with friends and family. The outdoors can become a little oasis if you can take advantage of every centimetre of space smartly. You don't need a lot of money, you just need to take a bit of time and effort to create the perfect outdoor area. At homify, we want to look after you before summer hits so we have collected some great ideas when it comes to creating the most intimate and stylish patio and maximising it. 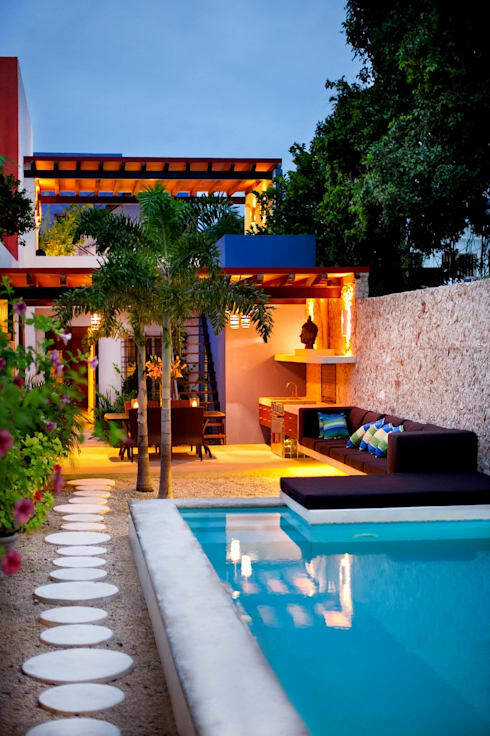 Let's take a look at these dream patios that we can all learn a thing or two from! The best thing for visitors… have a room in the garden! The best way to organize a party or a gathering in your home is to have a gorgeous outdoor spot where you can receive guests. Invest in comfortable furniture! To take advantage of all of the space available, it's important to include several spaces in one. Think big! This space doesn't just have to be a seating area near the swimming pool or a sunbathing spot. You can also put some chairs and a table in the corner to enjoy a nice dinner outdoors or a bar where you can prepare drinks. You can even have a space for exercising! Tip: Invest in durable yet comfortable patio furniture! Ideally your patio should be multi-functional. Utilise the swimming pool but also make sure there is a space for family gatherings. 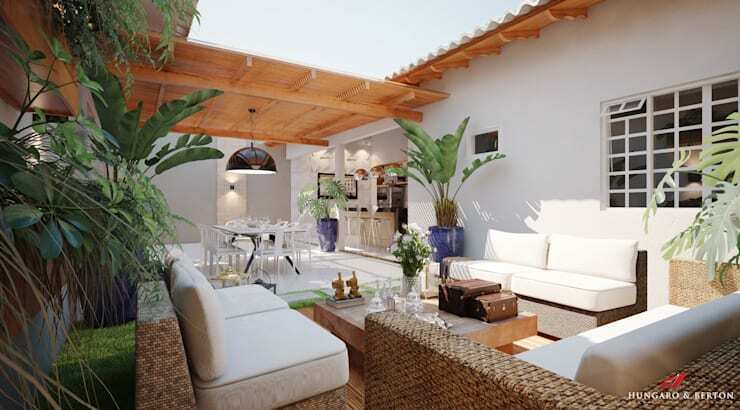 There should always be enough space for guests, with comfortable armchairs and garden tables. If you don't have that much space available to you, then connect the exterior space with the interior of the home. 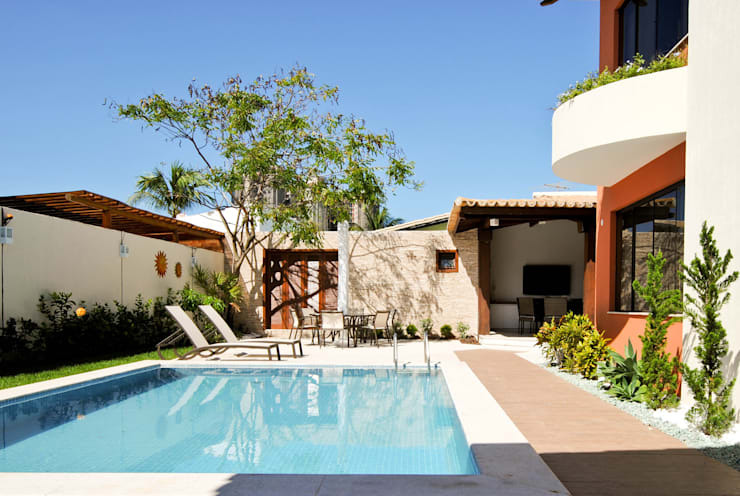 In this design by professional architects Taller Estilo we can see how the interior spills out onto the exterior, creating a large living space next to the swimming pool. There is also a braai area and a dining table, which are integrated into the house design. 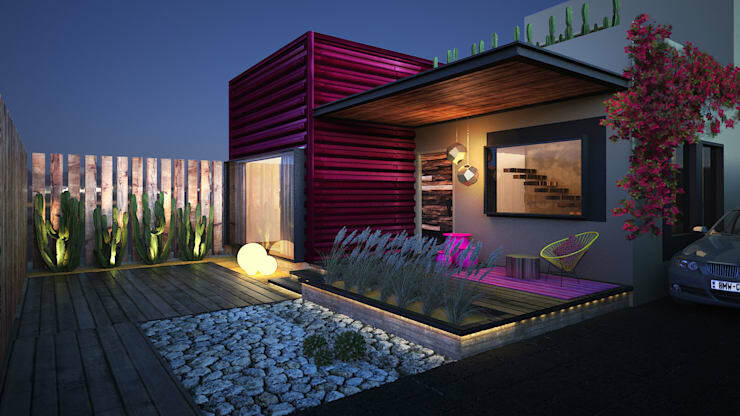 Make sure that the materials that use outdoors match the interior design too! Have a look at these: 5 ways to optimise space on your small patio. 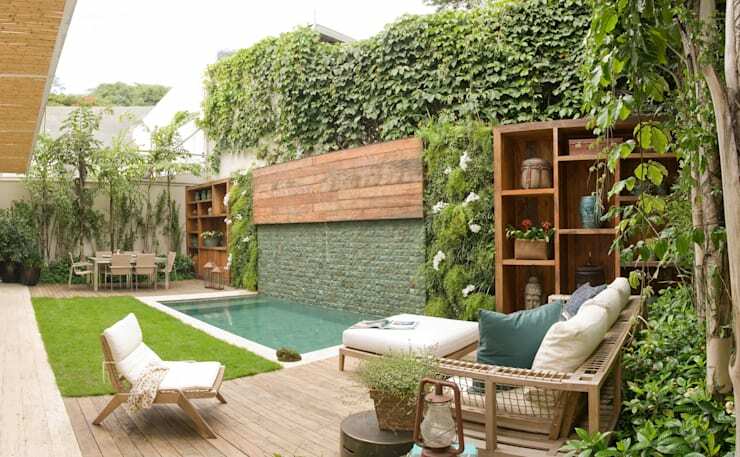 Decorate the walls of your outdoor space with vines or vertical gardens, creating a rustic or bohemian look and feel. This will not only add some personality to the space, but it will bring in a cosy and natural style. 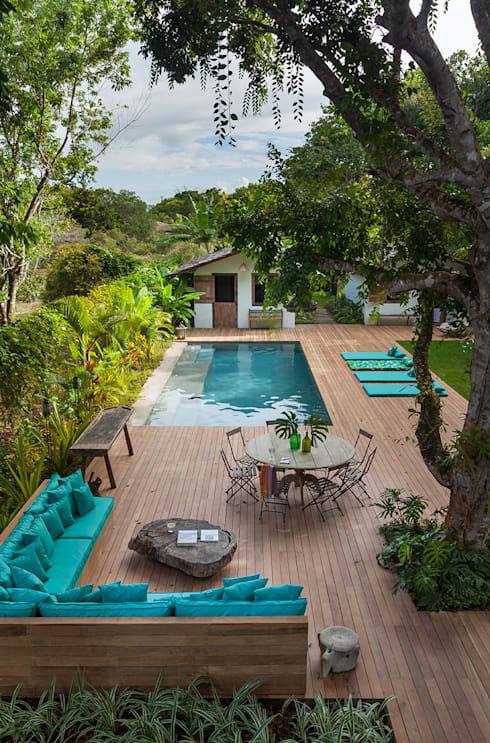 A wooden deck or wooden furniture can enhance this style and is a durable material to use for the outdoors. It also breaks up the use of green throughout. Have a look at these tips on how you can create and plant a vertical garden—beautiful! 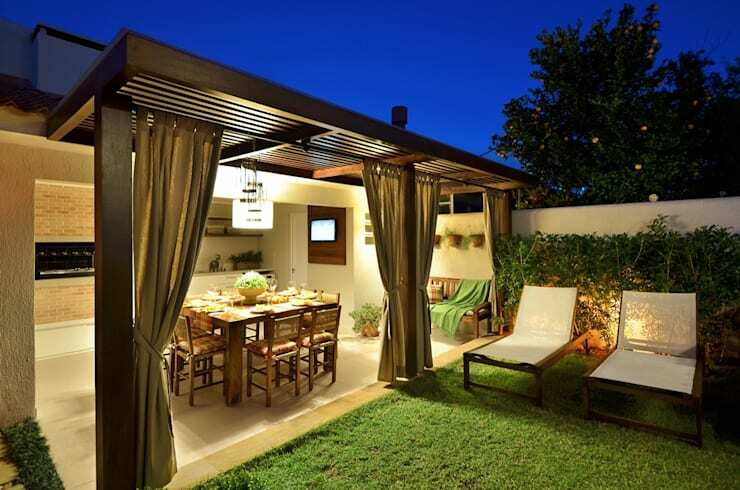 You can also invest in a shelter for your patio, so that you can protect it from the outdoor conditions. While South Africa has very warm weather in summer, you may want some shade or protection. You also want to enjoy this space during the summer storms. Invest in a sturdy roof that will keep you and your furniture protected. If you have a wall or a fence that houses your garden, you may want to improve the aesthetics by placing vines or bushes along the perimetre. By covering the entire wall or fence, you can make this space that much more beautiful. You can also add some flowers or plants for decor. Not everyone is lucky enough to have panoramic views of the landscape but if you are one of those people, your outdoor space should revolve around this. You can include some comfortable sofas, chairs and a fire pit, which will become the centre of meetings and good conversations. 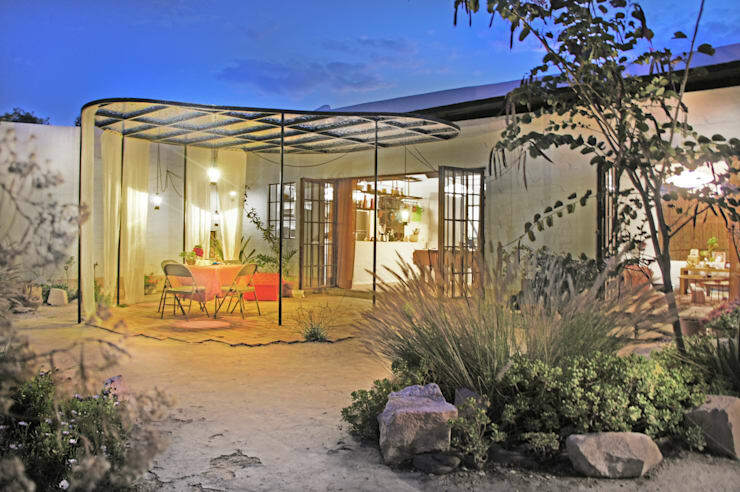 For your outdoor space to flourish, don't forget about the lighting. Lighting is a key element, which can give a unique look and feel to the garden space. Opt for ceiling lamps, bulbs or floor lights. If you can add some colour to this, even better! Which is your favourite patio?